A GOOD DAY trip out is hard to beat. You can pack in all the fun and freedom of a weekend mini-break but with the added bonus of your head hitting your own pillow safely tucked up at home afterwards. There’s no finer way to spend a Sunday than hop in the car and get gone. Ireland is a treasure trove of day trip destinations. We’ve tried to include a good spread around the country and these ideas are just a scratch at the surface. We’d love you to tell us your favourites in the comments section. Adjoining the Irish National Stud in Kildare, the Japanese Gardens are a real treat. Beautifully designed to trace out the life of man, these gardens are a real respite for those of us looking for a quiet and contemplative walk in a really unique setting. 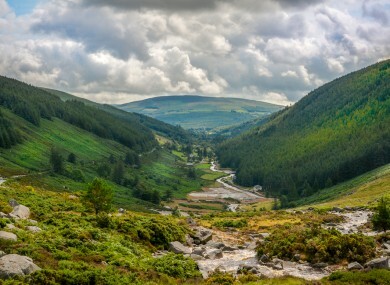 Glendalough is the perfect spot for soaking in some of Ireland’s God-given scenery. To get geographical for a second, it’s a glacial valley formed in the last ice age, which left behind some stunning views and natural wildlife. There’s also the ruin of a monastic settlement to take in. No Instagram filters necessary. Steeped in atmosphere and history, Dunamase is a must-see if you’re within driving distance of Laois, located just off the N80 near Electric Picnic stronghold Stradbally. The castle ruins are great to amble around, plus take in the views across the Slieve Bloom mountains to boot. The Hill of Tara is almost a by-word at this stage for the rich history of ancient Ireland and the archaeological marvels dotted around the country. Pictured above is the Stone of Destiny, which was the spot at which High Kings were crowned. You could do worse than take in a mythic coronation spot on your weekend day trips, in fairness. More than 4,000 years old, this pre-historic burial monument is the largest of its type in the country. It’s been said that it houses the Celtic Hag-Goddess, Cailleach Bheur, and it’s known locally as the Hag’s Bed. When first excavated, it was found to contain the headless skeleton of an adult female. Are your kids spooked enough for the trip home yet? What are your favourite day trips around the country? Let us know in the comments below, we’re all ears. Email “6 unmissable outdoor day trips to enjoy around Ireland”. Feedback on “6 unmissable outdoor day trips to enjoy around Ireland”.